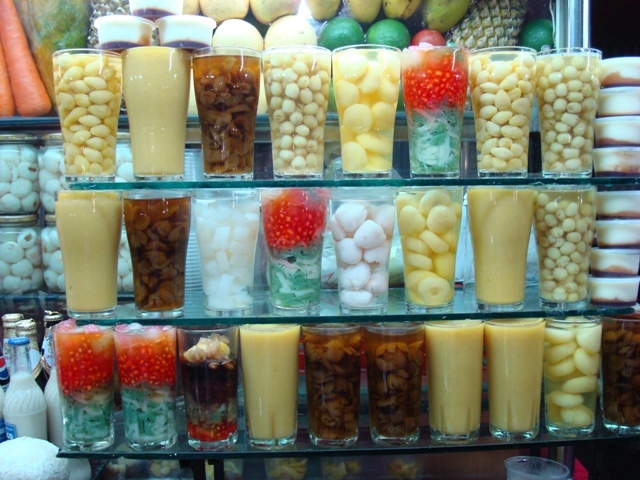 Pronounced with a falling or down tone, the Vietnamese chè is the name of a range of desserts that appear quite daunting at first. Not to be mistaken for any kind of relation to Che Guevara, the Argentine revolutionary, Vietnamese chè is often translated as “sweet soup”. An avid soup-lover myself, the sweet soup translation never really tickled my fancy. My Vietnamese colleagues soon put me on the right track. Around the corner from the office was a small restaurant that specialised in chicken with sticky rice and chè. The sticky chicken dish was fairly average, in my opinion, but the chè was an absolute winner. Soon I was sucking down chè like nobody’s business. Sago and banana chè. Lychee in syrup chè. 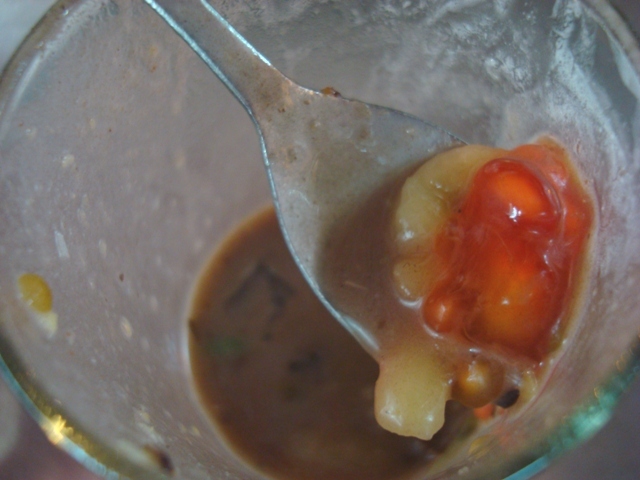 Lotus seed chè. I tried all the healthy fruit varieties but I kept coming back to the creamy super-sweet versions, with various types of lentils and beans. At first I couldn’t pronounce chè in a way that the vendors could understand. I carried a tattered scrap of paper in my purse inscribed with the words “chè ba màu”, my all-time favourite chè. 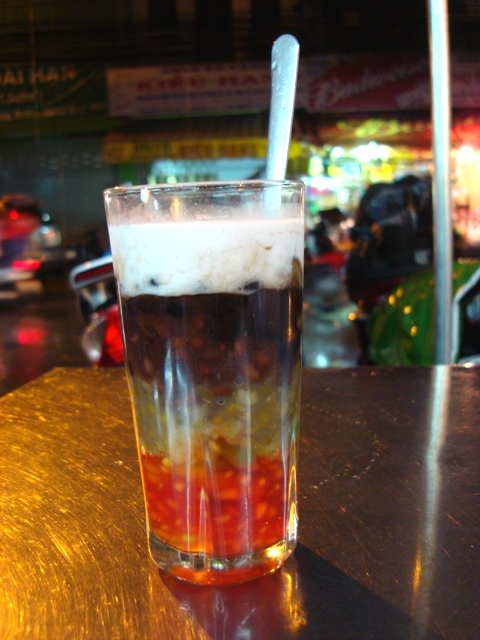 Literally three-colour chè, chè ba màu is usually served in a glass, topped with ice. The colours are layered and there’s usually more than three. So you usually get a yellowish custard-like layer of what I’m told is green beans but I think is actually yellow split peas, a red layer of fake pomegranite seeds, a layer of dark lentils and a layer of creamy coconut cream. I like the version pictured below that has a layer of green jelly snakes too. My chè is usally gone before the nearest friendly Vietnameses speaker can finish explaining what the various ingredients are. There’s a lot of sugar syrup, for sure. At first the concept of eating lentils and the beans used in baked beans in a dessert didn’t sit right with me. 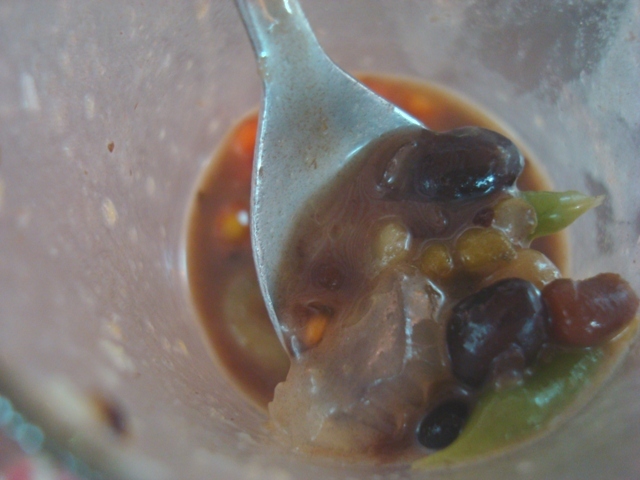 But the more I relaxed and the more chè I ate, the more it started to seem natural in a comfort-food kind of way. Unfortunately, as most budding artists discovered at the age of three, mixing beautiful colours together results in a purple-brown sludge. But chè does taste best all mixed up. Sitting on an aluminium stool, leaning over a sticky aluminum table, with traffic whizzing past, decripit lottery sellers tapping you on the shoulder, drunk guys bumping your back, giggly school girls squirming against your elbow, the vendor yelling across your head at his wife … ah, is there a more romantic setting for a dessert date? Probably. But this is Vietnam, which has a surplus of noise and people and joy. And fantastic food. If you have never tasted durian, take it from me, it’s like fart-flavoured custard. And fart flavour is not what a Westerner wants in a dessert. Or in a post-dessert kiss. There’s also warm chè, which seems to be more of a restaurant thing. I can’t say no to chè chuối chưng, a warm pudding of banana and sago pearls in coconut cream. Similar gloopy soupy desserts are served throughout Asia. They have different names but take it from me, they must be tried, even if you don’t like lentils or lurid colours in your food. The Philippine halo halo comes with a purple taro icecream – yum-de-dum lip-smackingly good — and the Singaporean-Malay version is chendol, which comes with a fruit syrup. However, I never did elicit much enjoyment from Vietnam’s seaweed chè. That may be connected to the bout of food poisoning I got, which was entirely unrelated to the street food seaweed chè I ate just prior to the first stomach pangs. Editor’s note: Darling Man reckons if a Western says chair baa mao (baa like a sheep, mao like Mao Zedong) a vendor will understand. But I’m not wholly convinced. This looks delicious. It’s always hard to think outside your comfort zone for food. I felt the same way about rice pudding- what is rice doing in my dessert? These look tasty. However, I will definitely stay from anything described as fart-flavored. yuck. Wow looks really nice. I have to admit though I wouldn’t expect it to be a desert though! am coming down to vietnam this week! i can’t wait to try their version of this dessert. thanks for sharing! An ode to che, a poetic post about an incredible food. You have such a vivid way of describing the scene too, I felt as if I was sitting right next to you in all that hustle and bustle. I’ve got mixed feelings about this. Your photos and descriptions are, as usual, so appealing. I guess it’s just quite different for me — all the more reason I should make sure to try these desserts sometime! About the durian — I only recently heard about this from a few people. It does not sound like something I need to experience! I have an aversion to chunks in my food, so I don’t think this is for me! Looking forward to watching the countdown to your 2012 escape. How do you go with soups and stews and Indian food with your chunk-phobia? I reckon you must miss out on some terrific food. Bring on the chunks, I say! Ohh, that’s an interesting one. It looks a bit like an ancient Turkish dessert called asure. That’s a sweet syrupy dish with barley, chickpeas and beans in it. I’m slowly growing to like it but haven’t really got a sweet tooth – and like your che – it’s very sweet. Yum. Very very sloppy looking, but still yum. Totally wish I had read this before we were in Vietnam, I would have gotten up the nerve to try it, but as you said, it’s hard to order and harder to find out what’s inside. Jillian, the best Vietnamese food can be pretty inaccessible, especially street food items that can be hard to spot in the chaos of street life. Darling Man and I are working on an ebook on this very topic. Stay tuned. I’m with Robin here, it looks like a terrible accident! A romantic dessert – for a date with who???! Sarah Palin? John in France recently posted..Paris – The City of Wuv! It’s a romantic dessert for a date with any man brave enough to try it! I was already enjoying this post, and then you mentioned Durian and I got even more excited!!! I want a Che now! I’m waiting for Durian season to start in a few months here in Thai Lan! I love your food posts! It sounds…interesting, I hadn’t heard about it before. Love your description of durians, so true! Sweet soup, eh? I’m dubious but I’d like to try it! I read the title of the post and thought of Che Guevara and you mention him in the second paragraph, how funny is that?! Ever notice all the best addictive type things are brown: coffee, chocolate, beer, coke…..and che (all mixed up)! Stop! Now I feel like coffee, chocolate, beer, coke and … potato chips! I think I would have to get over the whole “there are beans and lentils in my dessert”. Ché certainly looks interesting though in color and texture. I must admit the first time I realised there was lentil and beans in the dessert, it was already in my mouth. It took a bit of getting used to. There’s a barley water drink that’s popular in Singapore and I can’t do that. Barley is for soup and no amount of sugar will make it taste right in a drink. The first photo looks so yummy (though just behind them to the left it looks like they have eyeballs in jars). Oh, that made me laugh. I think the eyeballs are actually lychees.